See the naked peaks - devoid of trees and the brownish Lodgepole pine trees below? Here is a photo of the forests around the rockies but if you look closer you'll see that many of the trees have died and turned brown. This is because of a Mountain Pine Beetle epidemic that is destroying the mountain timber throughout the entire Rocky Mountains! 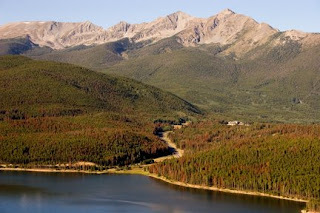 Colorado has 1.7 million acres of lodgepole pine forests. Though, if you have any desire to see any of those trees alive, I’d suggest you move rather quickly. State and federal officials recently announced that the mountain pine beetle epidemic grew by a half a million acres in 2007, bringing the total infestation in the state to about 1.5 million acres. Foresters indicated that the epidemic would virtually eliminate every acre of lodgepole pines in the next three to five years. Although the beetle is a full-time resident of the temperate coniferous forests of the Rocky Mountains, their numbers have grown exponentially in the last ten years, fed by a ‘perfect storm’ of contributing factors, including a steady pattern of rising temperatures. In the past, extreme cold temperatures at higher altitudes have significantly reduced beetle populations. But, ever since the most recent outbreak began in the mid-1990s, extreme cold periods in the Rockies have not been extreme enough. For freezing temperatures to affect a large number of larvae during the middle of winter, temperatures of at least 30 degrees below zero must be sustained for at least five days. Locals have come to accept that, for the most part, the beetle cannot be stopped. The good news is that folks in the mountain towns of Colorado are not willing to simply let the beetles win. Facing daily changes to their familiar green landscapes, and dealing with the potential of catastrophic wildfire, large-scale erosion leading to watershed quality problems, and loss of tourism dollars, communities in Colorado are forming innovative, multilevel collaborative partnerships to come up with new ideas and plans of action for an epidemic that knows no political boundaries. The biggest obstacle for community organizations is not political will, it is the significant resources required for the large-scale thinning of at-risk areas. Currently, the average price of thinning one acre of forests in Summit County, CO is about $2000. Limited funding obviously means that not every acre can be treated. The reason for the high cost of forest thinning is that there is no market for the beetle-kill wood. I would argue that Gobal warming is being most keenly felt in the remaining Pine forests of America - the boundary waters, the black hills and the Rockie Mountains. Pine forrests are the remains of our ice age so that makes alot of sense that they would be put under immense stress as the earth warms. So sad and we saw the brown lodgepole pine trees all over Colorado last summer! We thought the brown trees were caused by drought but there were plenty of waterfalls - now I know the cause! We see the huge stresses in all the Pine forrests in the lower 48 states in the USA. Great Comment - I am from Minnesota, where we have the Boundary Waters Canoe Area, the largest coniferous forest in the lower 48 states - no Pine beetles yet but the elimination of coniferous/pine forests have begun. The boundary waters has the only "boreal forest" in the lower 48 and as the earth warms - it will disappear. Then, the great lakes will slowly evaporate - see the levels of the Great Lakes today....record lows! Just think, at the end of the last ice age the great lakes formed and the great pine forests formed - as the ice age completely ends - no more great lakes, no more pine forrests. This change can happen really, really fast a matter of years - so it will be a shock. I'm intested in what we can do to stop this from happening...I can't imagine Minnesota without lakes and pine trees - but it's happening. But I am left with the notion that thinning Lodge Pole stands is the only option available for landowners. I live in BC where 40 million acres are infested. The forestry level battle here is lost. Many folks are successfully fighting the epidemic on private lands. You can get your trees through thing if the proper Integrated Pest Management strategies are implemented and practised till this passes. It will. Its a common sense approach.